Inchies have been around the crafting scene for awhile, but I only heard about them recently as they are apparently are making a comeback in popularity. In fact, I have heard it said that inchies are the new ATC. 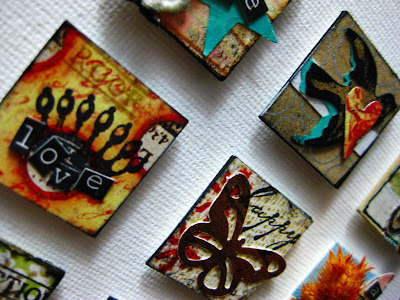 I love making ATCs (Artist Trading Cards) and so naturally, I was intrigued by the idea of playing with inchies. What is an inchie, you might ask? Well basically, they are teeny tiny little pieces of art. They are one inch square in size, which is where they get their adorable name. 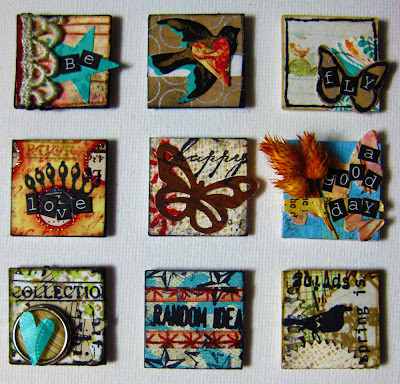 Typically inchies feature collage and stamping, although fabric inchies have been known to be popular with quilters and mixed media artists. There are plenty of inspirational resources online if you would like more information about inchies, including an Inchies Flikr Group. So what do you do with an inchie after you make it? Plenty of things! - begin a collection and start making a lot more! I hope this project inspires you to make your own teeny tiny works of art. Have a great day and have fun creating! These are fabulous and I agree with Kimberly, you are so inspiring! WTG Christina, I love them! wow I love this idea! thanks for spreading the news on this, I had not heard of them! !